, a learned controversial divine of the church of England, was born at Charlton upon Otmore, near Oxford, March 15, 1582. Fairclough was the name of his ancestors, so spelt by his grandfather, father, and eldest brother, and it appears that he was ordained by the same. 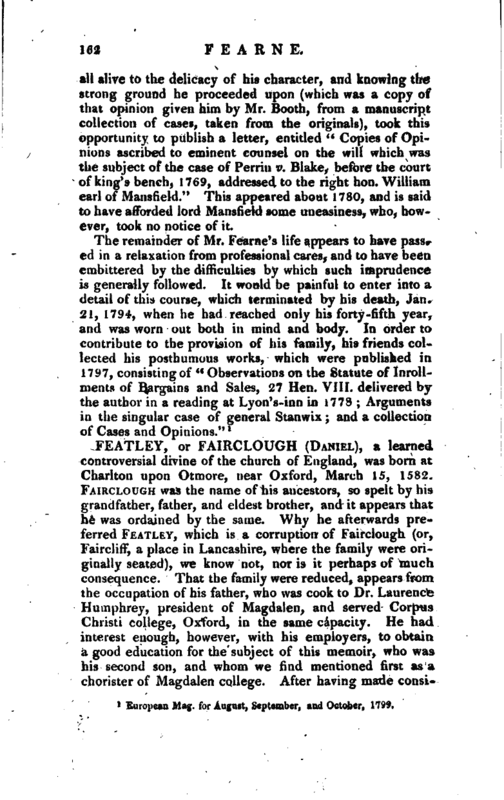 Why he afterwards preferred Featley, which is a corruption of Fairclough (or, Faircliff, a place in Lancashire, where the family were originally seated), we know not, nor is it perhaps of much consequence. That the family were reduced, appears from the occupation of his father, who was cook to Dr. Laurence Humphrey, president of Magdalen, and served Corpus Christi college, Oxford, in the same capacity. He had interest enough, however, with his employers, to obtain a good education for the subject of this memoir, who was his second son, and whom we find mentioned first as a chorister of Magdalen college. After having made | considerable progress in the school belonging to that college, where, even at twelve years old, his Latin and Greek exercises were noted for their excellence, he was admitted scholar of Corpus Christi college, Dec. 13, 1594, and Sept. 20, 1602, when B. A. was chosen probationer fellow. He commenced M. A. at the usual time, and was always eminent for his academical exercises, nor was he less noted as a disputant and preacher. In 1607 he delivered an oration at the death of Dr. Reinold, president of Corpus, who had been one of his earliest patrons. In 1610, and the two following years, we find him in attendance upon sir Thomas Edmondes, the king’s minister at the court of France. 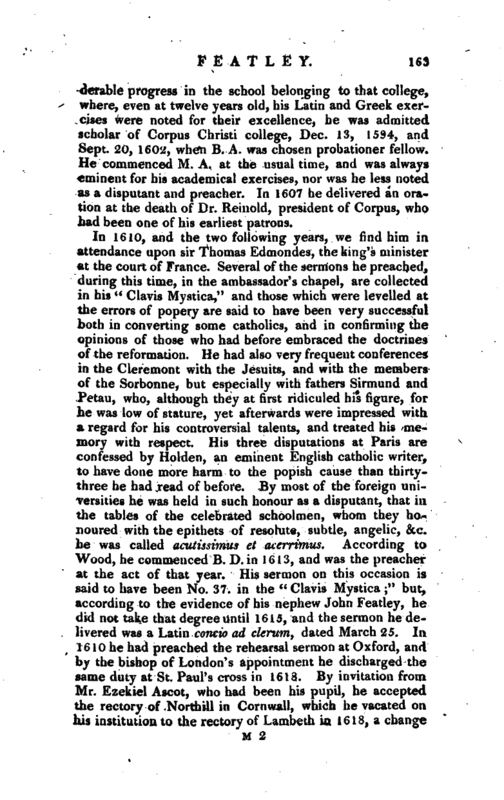 Several of the sermons he preached, during this time, in the ambassador’s chapel, are collected in his “Clavis Mystica,” and those which were levelled at the errors of popery are said to have been very successful both in converting some catholics, and in confirming the opinions of those who had before embraced. the doctrines of the reformation. He had also very frequent conferences in the Cleremont with the Jesuits, and with the members of the Sorboane, but especially with fathers Sirmund and Petau, who, although they at first ridiculed his figure, for he was low of stature, yet afterwards were impressed with a regard for his controversial talents, and treated his memory with respect. His three disputations at Paris are confessed by Holden, an eminent English catholic writer, to have done more harm to the popish cause than thirtythree he had read of before. By most of the foreign universities he was held in such honour as a disputant, that in the tables of the celebrated schoolmen, whom they honoured with the epithets of resolute, subtle, angelic, &c. he was called acutissimus et acerrimus. According to Wood, he commenced B. D. in 1613, and was the preacher at the act of that year. His sermon on this occasion is said to have been No. 37. in the “Clavis Mystica;” but, according to the evidence of his nephew John Featley, he did not take that degree until 1615, and the sermon he delivered was a Latin concio ad clerum, dated March 25. In 1610 he had preached the rehearsal sermon at Oxford, and by the bishop of London’s appointment he discharged the same duty at St. Paul’s cross in 1613. By invitation from Mr. Ezekiel Ascot, who had been his pupil, he accepted the rectory of Northill in Cornwall, which he vacated on his institution to the rectory of Lambeth in 1618. a change | which, if not more profitable, was certainly highly agrees ahle to him, as he became now, by the recommendation of the university, domestic chaplain to Abbot, archbishop of Canterbury. In 1619 he preached at Lambeth church, or in the chapel of the palace, seven of the sermons in the “Clavis Mystica,” before the king’s commissioners in ecclesiastical causes^ and on other occasions, and delivered his sentiments with uncommon freedom of spirit, which appears to have been habitual to him. By the direction of archbishop Abbot, who was desirous that De Dominis, archbishop of Spalato, should be gratified with the hearing of a complete divinityact, Mr. Featley, in 1617, kept his exercise for the degree of D. D. under Dr. Prideaux, the regius professor; and many other foreigners were present, with the flower of the English nobility and gentry. The Italian primate was so highly pleased with the performance, that he not only thanked his grace for the entertainment he had procured for him; but, being soon after appointed master of the Savoy, he gave Dr. Featley a brother’s place in that hospital. 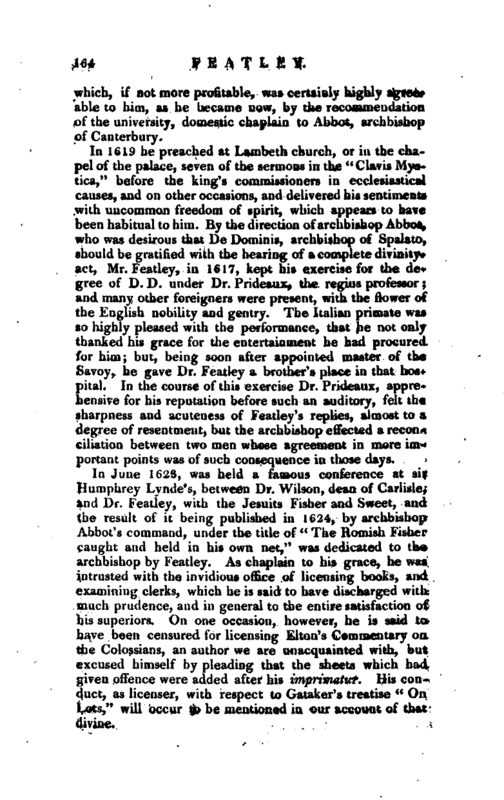 In the course of this exercise Dr. Prideaux, apprehensive for his reputation before such an auditory, felt the sharpness and acuteness of Featley’s replies, almost to a degree of resentment, but the archbishop effected a reconciliation between two men whose agreement in more important points was of such consequence in those days. Hitherto the archbishop had bestowed no preferment on. his chaplain; but in 1627, as we are told, “urged by hearing the discontents of the court and city, because his chaplain was kept behind the hangings,” he bestowed on him the rectory of Allhallows, Bread-street, and afterwards the rectory of Acton. Much about the same time, but the year not known, he was appointed provost of Chelsea college, an institution which did not last long. In 1622 he had married Mrs. Joyce Holloway, who was his parishioner, and resided in Kennington-lane. This lady appears to have been considerably older than Dr. Featley, but was a woman of great piety and accomplishments. He concealed his marriage for some time, lest it should interfere with his residence at Lambeth palace; but in 1625 he ceased to be chaplain to the archbishop, and concealment was no longer necessary. The cause of his quitting the archbishop’s service has been represented as “the unfeeling treatment” of that prelate. But of this, his biographers have made too much. The story, in short, is, that Dr. Featley fell sick at Oxford, supposed of the plague, and was obliged to leave the place and go to Lambeth; and when he found that the archbishop had removed to Croydon for fear of the plague, he followed him thither, and the archbishop refused him entrance, and was surely justifiable in every endeavour to prevent the disorder from extending to the place he had chosen as a refuge. The story is told with some confusion of circumstances, but the above is probably the truth. 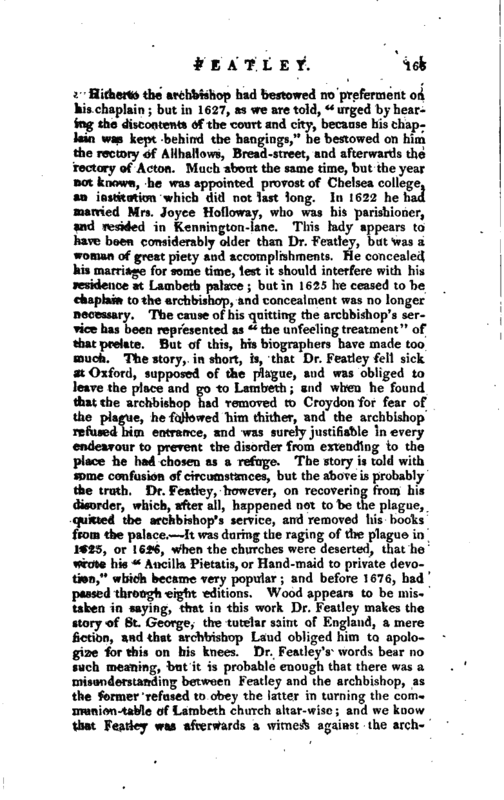 Dr. Featley, however, on recovering from his disorder, which, after all, happened not to be the plague, quitted the archbishop’s service, and removed his books from the palace. It was during the raging of the plague in 1625, or 1626, when the churches were deserted, that he wrote his “Ancilla Pietatis, or Hand-maid to private devo* tion,” which became very popular; and before 1676, had passed through eight editions. Wood appears to be mistaken in saying, that in this work Dr. Featley makes the story of St. George, the tutelar saint of England, a "mere fiction, and that archbishop Laud obliged him to apologize for this on his knees. Dr. Featley’s words bear no such meaning, but it is probable enough that there was a misunderstanding between Featley and the archbishop, as the former refused to obey the latter in turning the communion-table of Lambeth church altar-wise; and we know that Featley was afterwards a witness against the | archbishop, upon the charge of his having made superstitious innovations in Lambeth church. While the ecclesiastical constitution stood, Dr. Featley was member of several of the convocations; and upon account, as is supposed, of his being a Calvinist, he was in 1642 appointed by the parliament one of the Assembly of Divines. He is said to have continued longer with them than any other member of the episcopal persuasion; but this was no longer than he discovered the drift of their proceedings. That he was not acceptable to the ruling party, appears from his becoming in the same year, a victim to their revenge. In November, the soldiers sacked his church at Acton, and at Lambeth would have murdered him, had he not made his escape. These outrages were followed Sept. 30, 1643, by his imprisonment in Peter-house, in Aldersgate-street, the seizure of his library and goods, and the sequestration of his estate. Charges were preferred against him of the most absurd and contradictory kind, which it was to little purpose to answer. He was voted out of his living. 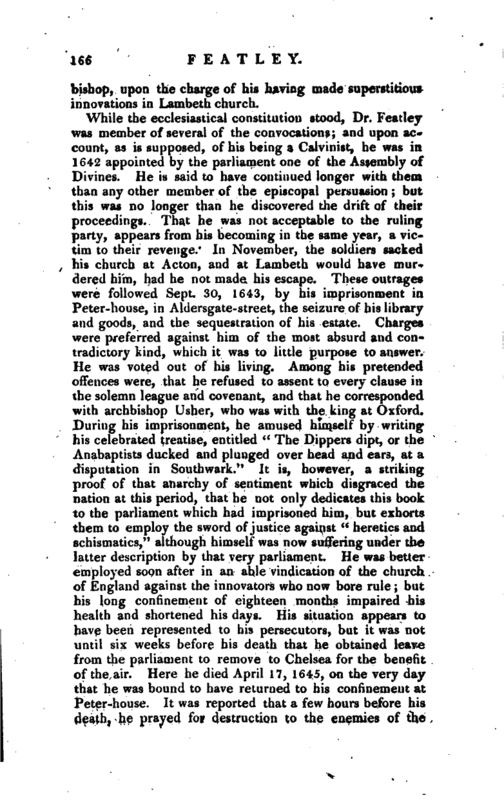 Among his pretended offences were, that he refused to assent to every clause in the solemn league and covenant, and that he corresponded with archbishop Usher, who was with the king at Oxford. 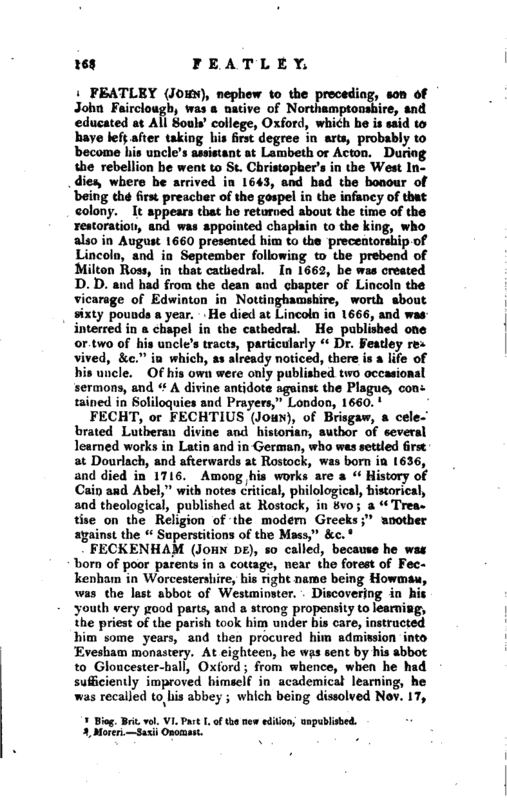 During his imprisonment, he amused himself by writing his celebrated treatise, entitled “The Dippers dipt, or the Anabaptists ducked and plunged over head and ears, at a disputation in Southwark.” It is, however, a striking proof of that anarchy of sentiment which disgraced the nation at this period, that he not only dedicates this book to the parliament which had imprisoned him, but exhorts them to employ the sword of justice against “heretics and schismatics,” although himself was n’ow suffering under the latter description by that very parliament. He was better employed soon after in an able vindication of the church of England against the innovators who now bore rule; but his long confinement of eighteen months impaired his health and shortened his days. His situation appears to have been represented to his persecutors, but it was not until six weeks before his death that he obtained leave from the parliament to remove to Chelsea for the benefit of the air. Here he died April 17, 1645, on the very day that he was bound to have returned to his confinement at Peter-house. It was reported that a few hours before his deaih, he prayed for destruction to the enemies of the | church and state, in expressions which have been called “irascible and resentful.” How far they were used by him seems doubtful but had he prayed only for the restoration of the constitution in church and state, it might have still, in those times, been imputed to him that the destruction of their enemies was a necessary preliminary and a fair innuendo. 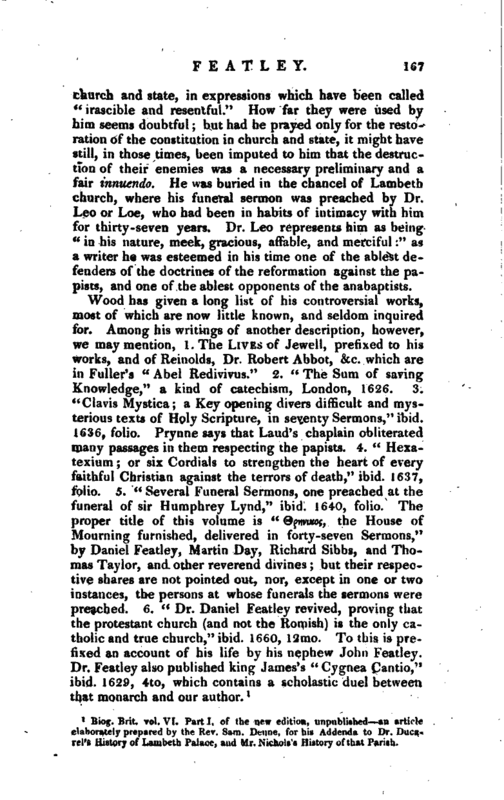 He was buried in the chancel of Lambeth church, where his funeral sermon was preached by Dr. Leo or Loe, who had been in habits of intimacy with him for thirty-seven years. Dr. Leo represents him as being “in his nature, meek, gracious, affable, and merciful:” as a writer he was esteemed in his time one of the ablest defenders of the doctrines of the reformation against the papists, and one of the ablest opponents of the anabaptists. Biog. Brit, vol. VI. Part I. of the new edition, unpublished an article elaborately prepared by the Rev. Sam. Dome, for his Addenda to Dr. Ducarpl’s History of Lambeth Palace, and Mr. Nichols’s History of that Parish.